Did Jose Mourinho pull one final trick on the media? Jose Mourinho warned the media in October that he would stop giving them "good and funny headlines"
Jose Mourinho is a master of the managerial dark arts. Whether it is winding up the other dug-out,cheekily predicting the opposition line-up, or allegedly hiding in a laundry basket to flout a stadium ban, he is always looking to gain an edge. And it seems, even after getting sacked from Chelsea on Thursday, the 52-year-old may have indulged in one final piece of subterfuge and skulduggery. On Thursday afternoon, a man with his hood pulled down over his face was driven away from Chelsea's Cobham training ground. The waiting paparazzi lit up the gloom with a barrage of flashbulbs and the resulting photos - presumed to be of Mourinho fresh from clearing his desk - appear in many of today's newspapers. However, is all as it seems? 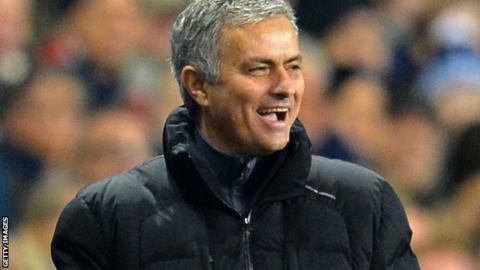 Jose Mourinho sports a chunky wedding ring. The figure in the passenger seat does not. Mourinho revealed in March that he celebrates every trophy-winning season by "retiring" the watch he has been wearing, keeping it in a safe as a memento of his success. He also has a sponsorship deal with a luxury Swiss brand that has produced a limited edition of 350 watches branded with his name. The watch worn by the man leaving Cobham in a hurry appears to be a mainly black number. It does not appear to match the model worn by Mourinho in his final pre-match press conference as Chelsea manager last Friday (on the left in the image below) and certainly is not the flashier design he sported earlier back in October (on the right). How did Premier League managers react to Mourinho's sacking? Why did it go wrong for Mourinho? The final exhibits presented in support of this theory are the hands themselves. Has the shock of losing his job caused sudden and severe manual hair loss? Did Mourinho - who shaved his head between losing to Leicester on Monday and losing his job three days later - also take the clippers to his hands? Or is it just the effect of a flurry of camera flashes? Either way, the man in the passenger seat on Thursday evening seems to have silky smooth hands where Mourinho, certainly last week, did not.